The Indian Prime Minister says the Russian-built aircraft carrier’s joining the country’s navy was a historic step. 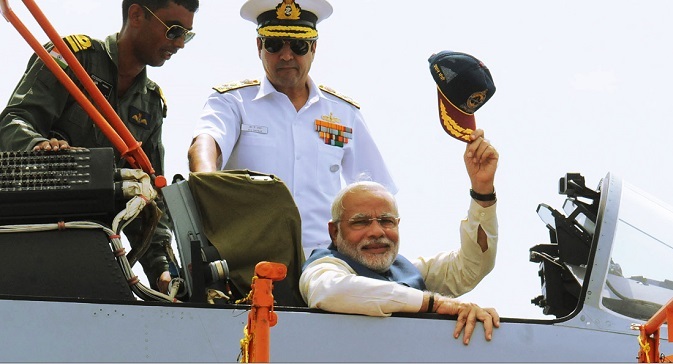 The INS Vikramaditya was dedicated to India by Narendra Modi at a special ceremony off the coast of Goa on Saturday, June 14. The prime minister arrived on board the Russian-built aircraft carrier by a Sea King chopper and was greeted with a ceremonial guard of honour by the navy. Russia handed over the INS Vikramaditya to India in November in a ceremony at Severodvinsk. The aircraft carrier left Russia in December and arrived in Karwar in January. The ship has a displacement of 45,000 tonnes, a maximum speed of 32 knots and an endurance of 13,500 nautical miles (25,000 km) at a cruising speed of 18 knots. On Saturday, Modi also sat on board one of the aircraft carrier’s MiG-29s, although he didn’t fly on the aircraft. The prime minister also called for India to become self-dependant when it comes to manufacturing defence equipment. “We need to give immense importance to latest technology. This will help the nation,” he said. Russia, which has traditionally been India’s largest and most reliable defence equipment supplier, has openly stated that it is ready to move on from a buyer-seller relationship with India and into technology sharing and joint development. Russia and India are working on the BrahMos cruise missiles. BrahMos missiles have been adopted by India's Army and the Navy’s surface ships. The Indian Air Force has also ordered a batch. Work is also underway to adapt the missile to Su-30MKI planes used by the Indian Air Force. Another major joint project is the Fifth Generation Fighter Aircraft (FGFA). The project is expected to enter the research and development phase. Defence projects with Russia will be discussed this week when Russian Deputy Prime Minister Dmitry Rogozin visit Delhi. The Rogozin visit is primarily meant to set the agenda for the talks that Modi will hold with Russian President Vladimir Putin on the sidelines of the BRICS summit in Brazil next month, but New Delhi is also likely to seek clarifications on Moscow’s defence ties with Islamabad.